According to Wiktionary, a well-oiled machine is something that operates capably through the effective coordination of many parts. Macmillan Dictionary, a recognized international publisher of encyclopedias, takes it a step further by defining it as a well-oiled system, project, or company that operates without problems. In any case, these systems or machines rely on a stable, highly functional foundation – employees. Employees, equipped with the right skill set, are the keepers of the efficiently running enterprise. With the onset of the “gig economy,” in which freelancers and contingent labor (AKA complimentary workforce or independent contractors) make up an increasing portion of a company’s resource pool, the dynamics behind hiring have changed radically. The erosion in the “lifetime career” employment model has been arguably displaced by the Managed Services Provider (MSP) model, whereby a third-party vendor/company handles primary responsibility for managing an enterprise’s independent contractors. These on-demand employment opportunities have grown significantly, particularly in this century. 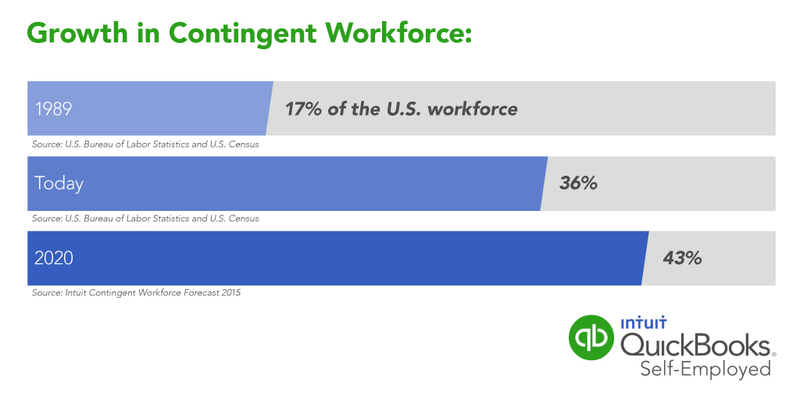 According to a recent study by Intuit, the financial software company, by the year 2020 43 percent of the United States workforce will be contingent labor. The accompanying chart illustrates the rapid growth in this labor type in the U.S. from 1989 to Intuit’s 2020 forecast. As businesses increasingly rely on the use of contracted labor to ensure their enterprise indeed remains well-oiled, the vetting process for resources is crucial. Since rapidly and effectively managing global resources can be challenging, cumbersome and costly for any business, the delivery and support of qualified resources are increasingly handled by reputable MSPs with years of experience. These MSPs are committed to attracting and retaining highly specialized global professional resources to swiftly engage, deploy and deliver value. While the basic responsibilities of an MSP may include general program management, supplier selection and management, reporting and tracking, among the most critical responsibilities is to ensure contractor compliance. Simply put, companies must adhere to federal regulations which determine whether to classify a hired resource as an employee of the company or an Independent Contractor. Since one of the principal risks in employing independent talent is misclassifying employees as independent contractors, due diligence in vetting is essential. SDI has deep expertise in small supplier spend and has been managing small suppliers on behalf of Fortune 500 companies since 1992. SDI’s continually evolving best practices program results in the provision of vetted, experienced, and trusted resources to business enterprises. Our contractor compliance program guarantees 100 percent adherence to federal law. More information on how we can be of help staffing your organization can be found here.